Home » 3DS » Amiibo » Fire Emblem Awakening » Mario Kart 8 » Mario Maker » Shin Megami Tensei X Fire Emblem » Splatoon » Super Smash Bros 3DS » Super Smash Bros Wii U » Yoshi's Wooly World » Nintendo Direct: Smash Bros, Amiibos and Fire Emblem OH MY! 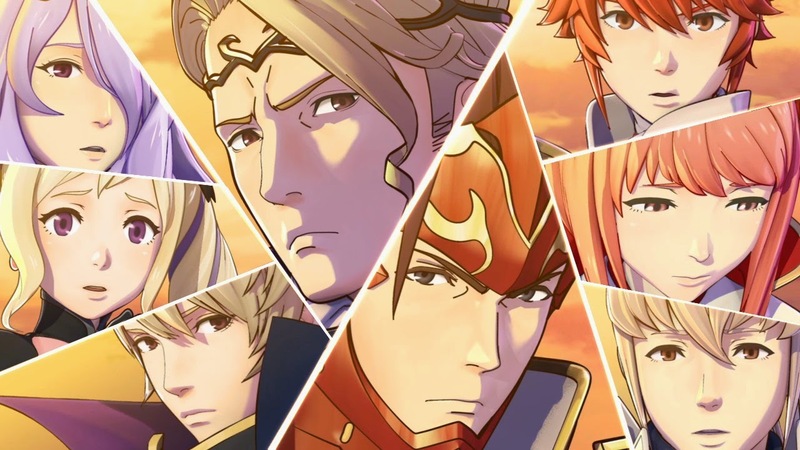 Nintendo Direct: Smash Bros, Amiibos and Fire Emblem OH MY! Forgoing the tomfoolery and hijinks of April Fools Day, Nintendo decided to drop all their latest news straight to the gamers again, with large helpings of details of all the upcoming games as well as a whole mess of DLC and Amiibo news, and we've got the roundup right here! The Direct started off showcasing the Legendary Pokémon Mewtwo, who is finally available to play in the latest Smash. If you purchased and registered both Wii U and 3DS versions, you can download him for free otherwise you'll have to drop some extra money if you want to play as the original Legendary monster. 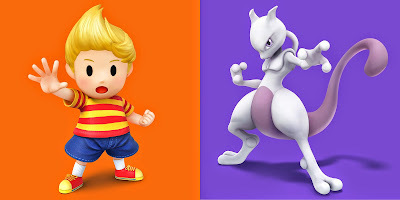 As well as Mewtwo, there was a surprise announcement of returning character Lucas who first threw down in Smash Bros Brawl and comes from the Japan only game Mother 3, better know as Earthbound in the West. Lucas is planned to be released some time in June. As well as these 2 new characters, a batch of 8 DLC costumes for custom Mii characters will become available to purchase. These include some outfits from other games, Dunban from Xenoblade, a Link outfit and a Majora's Mask facemask, Megaman X and Proto Man's armour sets, there's also a monkey and cat outfit as well as a Smash Bros T-Shirt. These can be purchased on either Wii U or 3DS, purchasing them for both systems will offer you a small discount if you decided to use them on both the console and handheld versions. Mario is having his 30th Anniversary this year, the original Mario Brothers game came out way back in September 1985 and Nintendo are releasing Mario Maker to celebrate this fact. Mario Maker is a special program where we can create your own Mario levels using a grid based layout to place all the platforms and enemies you desire. You can switch between 4 different design styles ranging from the old 8 bit styles Mario all the way up to the New Super Mario Bros design. You can even upload your created stages to the share with your friends and the whole world. 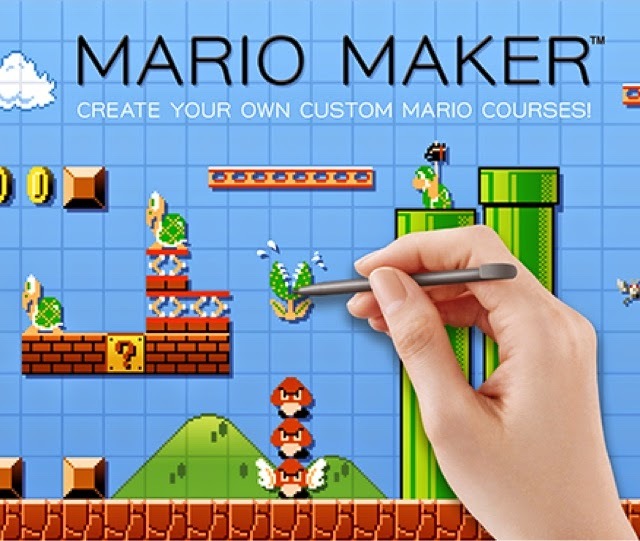 Mario Maker will be available in September 2015. Well, I'll just put this here and OH GOD! Mario's long time friend, Yoshi will also be getting his own game soon in the form of Yoshi's Woolly World. In a similar style to Kirby's Epic Yarn, Woolly World looks like it's created with brightly coloured string. The game can be as hard or as simple as you like as there's an option to switch to Mellow Mode, which allows you to fly around, avoiding all the enemies and platforming. There's even some Amiibo support where if you tap a Yoshi Amiibo, a second Yoshi will appear in the game for you to throw around as a weapon or use to reach higher platforms. Yoshi's Woolly World will launch in the Autum of 2015. We've seen Splatoon pop up on Directs a few times now, previously covered subjects were the multiplayer game type Turf War where you have to cover the floor in as much of your paint as you can before time runs out, and the single player game where you do battle against the Octopus Army. Announced today was Ranked Battles, while similar to Turf Wars, Ranked mode includes a ranking system. Featured games types here include Splat Zones which is kind of like a King of the Hill gametype where you must capture specific areas of a map with as much of your paint as possible, also announced is Battle Dojo, a local 1 V 1 game type with one person playing on the Wii U Gamepad while the other uses the TV. In this mode you have to see who can pop the highest number of balloons in a short time limit. Final news is about the Squidling Amiibos (shown below) touching an Amiibo will give you extra missions to complete, missions vary depending on which Amiibo you tap in. By completing these missions you can unlock special gear for customising your Squidling. Splatoon will be available on May 29th 2015. 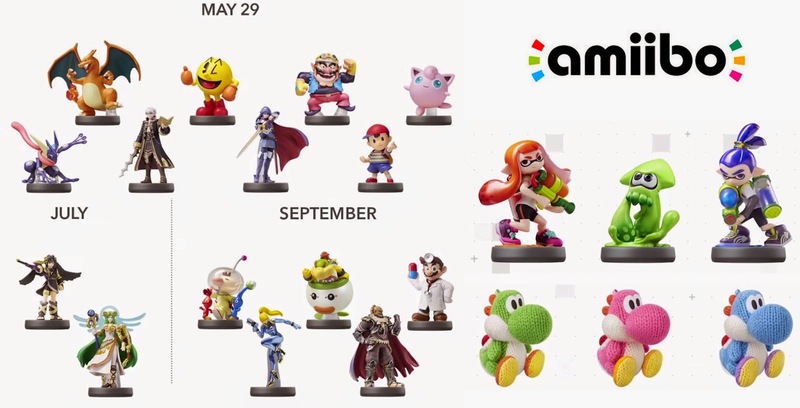 The Smash Bros series of Amiibos is getting a whole bunch of new plastic figurines, Charizard, Pacman, Wario, Jigglypuff, Greninja, Robin (male version), Lucina and Ness are all due to hit shelves this month. Pit and Lady Palutena are due in July with Olimar, Zero Suit Samus, Bowser Jr, Ganondorf and Dr Mario all coming in September. Mewtwo and Lucas will also get Amiibos in the near future. Also joining the Amiibo list comes Splatoon characters, one boy and one girl version of the Squidlings which can be purchased individually or in a bundle pack, and a green squid which can only be obtained in the triple pack or with a special edition of the game which is due the same day as the games release (see above). The most surprising Amiibo to be announced was the Woolly Yoshi Amiibo which for the first time, won't be made of plastic or stand on a base. The Yoshi Amiibos come in 3 different colours, green, pink and blue and will be available alongside the game on its release. There's also a whole new line of Amiibo for Animal Crossing, but rather than figurines, these will be card based. While my shelf space and wallet are both happy about this, I've secretly desired a tiny K.K. Slider figurine for a long time, ah well! The cards will be used for a new 3DS game called Animal Crossing Happy Home Designer. Using the cards will let you into the animal on the cards house, they will then give you instructions on the type of home they would like and you get to decorate them without having to do all the chores of a regular Animal Crossing game. You can also scan in more animal who will then visit the origianl animals house for a big party! HHD is due out in the Autumn. Moving on from the lists of new figurines, Amiibo Tap Nintendo's Greatest Bits is a new game that will be available on Wii U for free this Spring. Tapping an Amiibo will assign a random Nintendo title and then give you a 3 minute trial of a random stage from said game. Two Fire Emblem announcements came during this Direct, the first was the long awaited Shin Megami Tensei X Fire Emblem game previously announced way back in 2013. Unfortunately there were no new details about it other than just a reminder that it's still happening. The second game that was previously announced in the last Direct, our write up of that can be found here. Whereas in Fire Emblem Awakening where you played as a side character to Chrom, in this title you play as the lead character which can be fully customised to make your hero however you wish. Two factions are on the verge of War, the peace loving Hoshido and the glory seeking Nohr, your character being born in the Hoshido Royal Family but raised by the Nohr family, it's up to you to decided which side to fight on, will you fight for your bloodline, or loyalty to your adoptive family? Pick your side. Who lives? who dies? Dependant on which faction you decide on, the story and gameplay will be different, as the Hoshido you'll be challenged to join your allies and defend an encroaching invading army similar to older Fire Emblem games, this story is more accessible for players wanting a lower difficulty and newcomers alike. Play on the Nohr side, you'll be forced to revolution a country, which offers a far greater challenge than the Hoshido campaign. Obviously I'll be playing the game twice then, will you? Fire Emblem is currently set for 2016, look out for more details and a proper subtitle nearer the time. The final announcement in the Direct was the details of Mario Kart 8s DLC pack 2, the addition of 4 new racers, Isabelle, both a boy and girl version of the Villager and Dry Bowser all join the roster of drivers, as well as 4 new vehicles to burn around tracks in. There is also 8 new race courses to power slide and jump around on in the Crossing Cup and Bell Cup tournaments. The best news is that the release date has been moved forward from its previously stated May date to April 23rd. An update to the game will also happen on April 23rd to make more Amiibo compatible to add more outfits for your Mii racer. Mega Man, Pacman, Sonic, Toad, Wario, Villager, Rosalina, Bowser and Olimar will all have special suits for the Mii to wear. Personally I think the Pacman suit is by far the coolest one. As well as all of this, there's a new speed class available. 200cc mode races will truly test your driving abilities and you'll have to learn how to use the brakes for the first time in Mario a Kart history. This update for Amiibos and the 200cc class is all for free on the same day as the DLC.